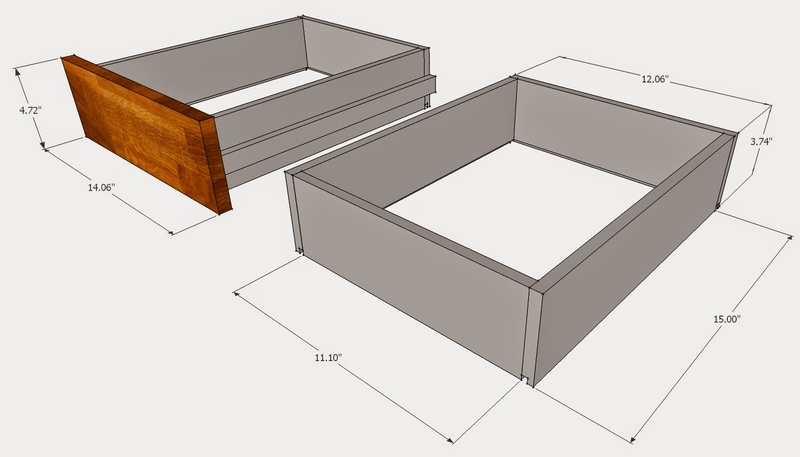 This time I took a different approach by using a SketchUp tool , this is a great tool and very easy to learn.You can find lots of helpful tutorials on Youtube. It helps a lot while planning and also offers a 3D view of the design. 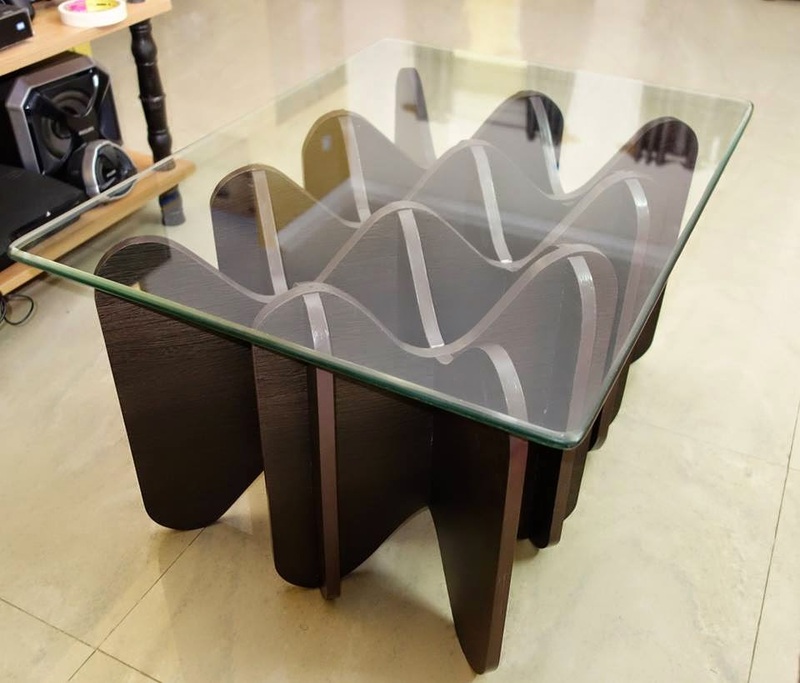 It also helps in reducing wastage of wood by precisely planning how to cut the wood board. Used Rubber wood this time as you get a far superior finish than plywood and also it s easier to work with than using normal wood as you don't have to plane and fix the imperfections. Was stocking these board for some time. 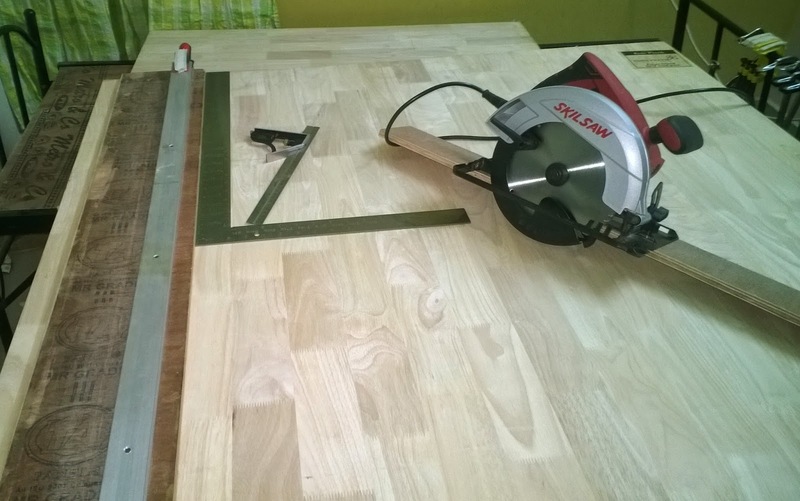 I have cut the board into 4'x4' piece for easy storage and working. Though I faced an issue as I forgot to seal the cut piece edges with tape and so the board wrapped. But it can be fixed easily by drying it on the cup side facing towards the fan. I also noticed that the boards emits a foul smell from time to time but this problem goes away after sealing the wood. 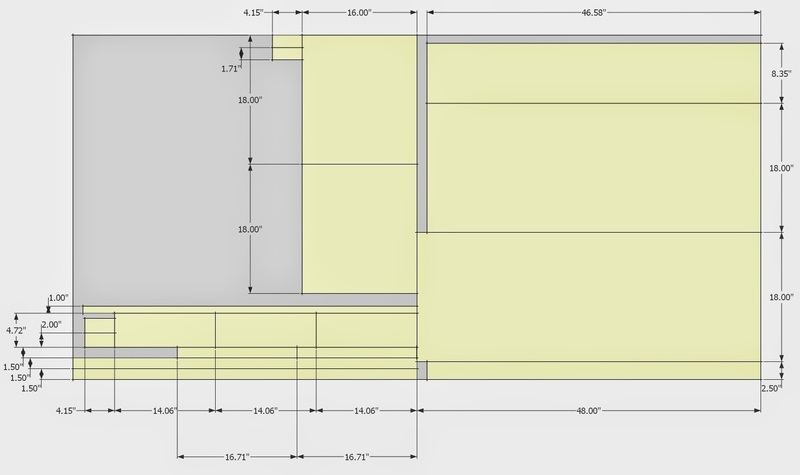 I used the SketchUp layout for cutting of boards. It costed me 150Rs/sqft for 18mm board. 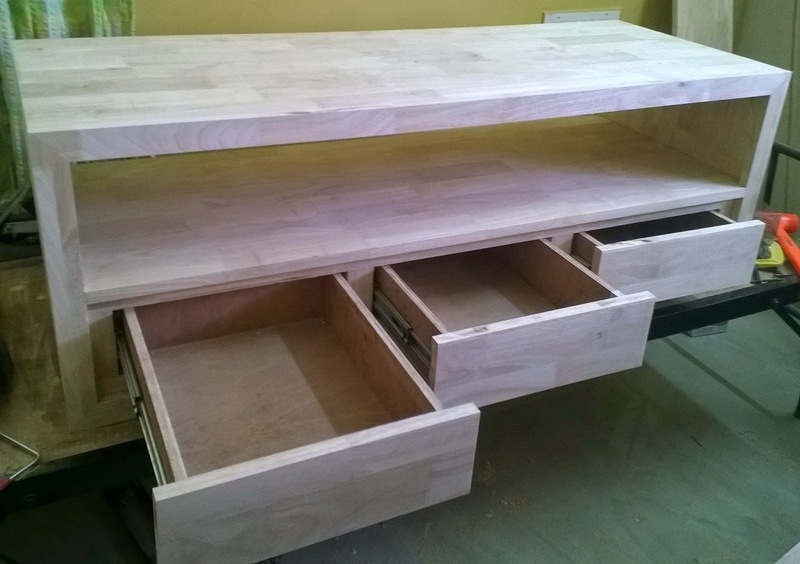 I have used 12mm Plywood along with the Rubber wood for the drawer inner frame and 6mm plywood for the drawer bottom. 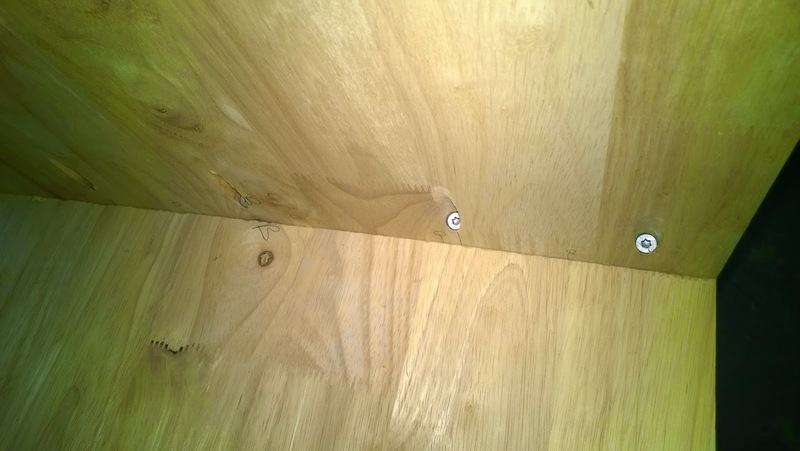 For joinery I have used pocket hole jig from Kerg which I had ordered from amazon.com. Pocket hole joins are strong and well concealed. Pocket hole screws are not available in local market and importing them will be expensive so I used dry wall screws with a M5 washer. 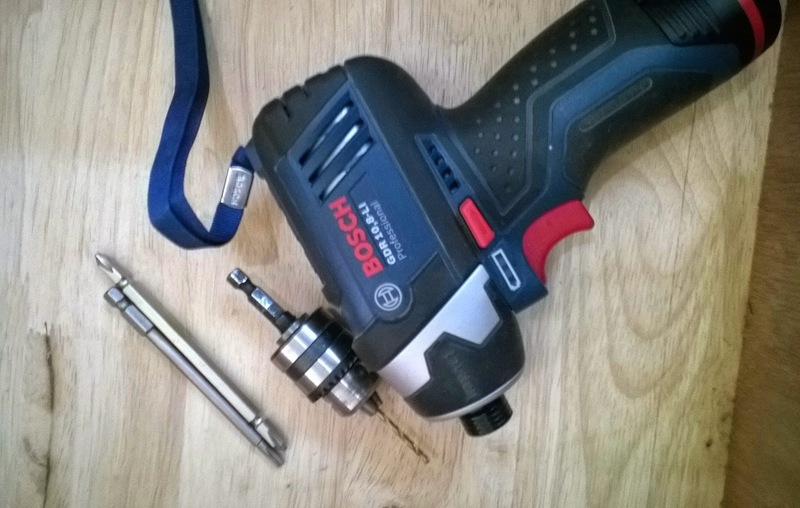 My Bosch Impact driver comes very handy in driving the screws and drilling holes. The interchangeable chuck makes life very easy as I can switch between drilling hole and driving screws quickly. I feel that impact driver is far better than a drill driver as you can use it for multiple purpose. Also unlike the drill driver impact driver does not give back kick when screw gets jammed and is gentle to the wrist. 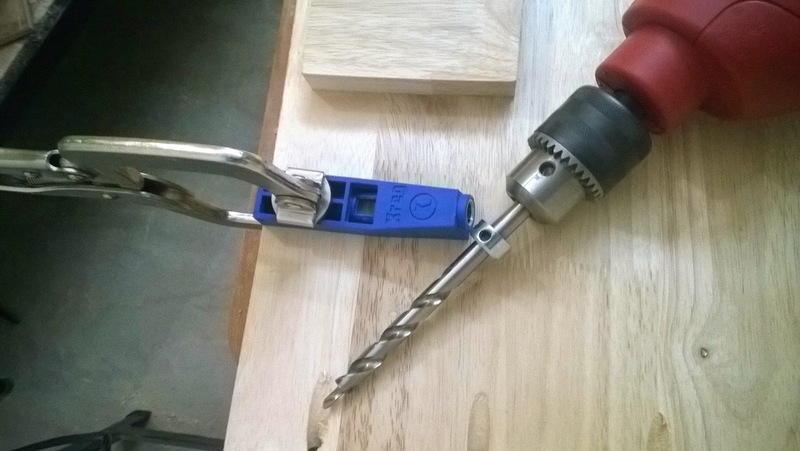 I have done a detailed review on this tool Bosch GDR 10.8 Review. 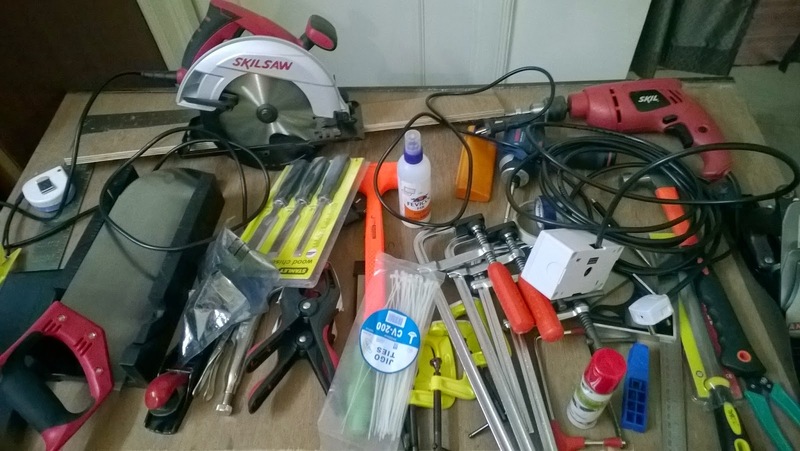 As I don't have a table saw as yet so I use my Skil 5301 circular saw to do all of the cuts. Making straight cuts with a circular saw is difficult without a edge guide and so I used a 4" long 12mm board with a aluminium channel on top as a saw guide also have bolted a long piece on bottom of the saw to give extra support while cutting. This time I also managed to reduce the Saw dust as no matter how much care is taken it still gets settles all across the house and takes a lot of effort in cleaning. 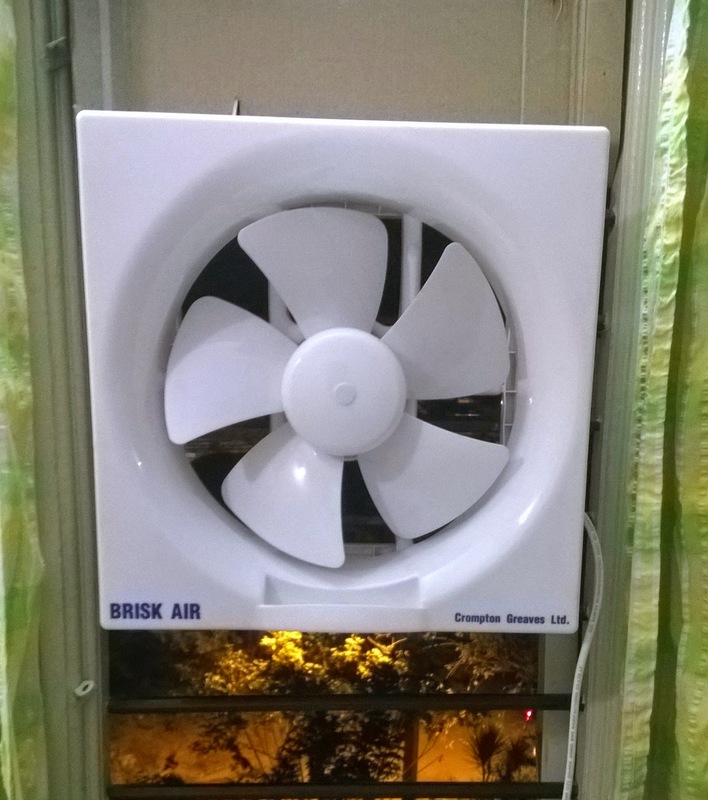 So I installed a 250mm exhaust fan on the window of the room where I cut the wood with the help of zip ties as it is just for temporary use. It is of great help to remove the fine saw dust also at the time of finishing it helps to remove the toxic vapors of thinner and varnish. Clamps come in very handy to fasten the pieces while gluing or cutting the pieces, you can never have enough clamps. Have a few F-Clamps, C-Clamps and Pinch clamps. I prefer Fevicol MR for joinery than Fevicol SH as it comes in easy to apply bottle and has a quick drying time, the only time Fevicol SH is used is when gluing laminate as it is cheaper than Fevicol MR. 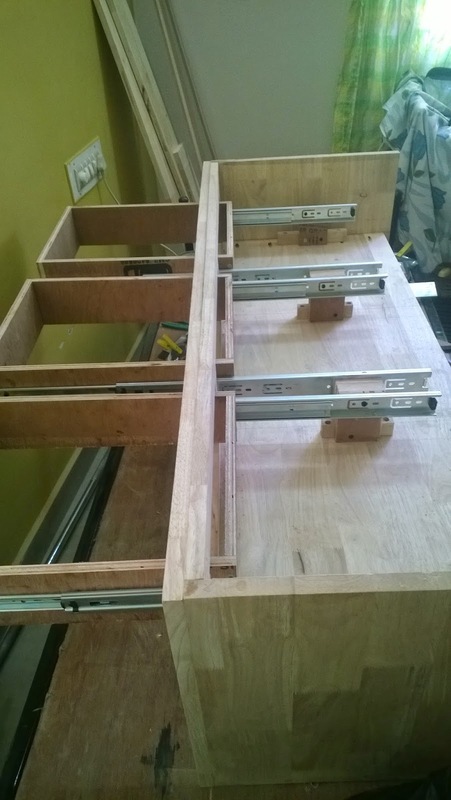 Channels for fitting the drawers, you can find them easily at any hardware store. They come in a size difference of 2" so keep your drawer dimensions accordingly. Finishing of Drawers is a difficult task so be careful at the time of cutting, a little resizing can be done at the finalization by sanding. Have used Walnut stain to give a more professional colour to the project. First the wood has to be sanded with 180 grit sand paper then 320 grit sand paper. Once the surface is smooth apply sanding sealer in 50:50 diluted ratio with NC thinner and wipe it out. This is done to make the stain absorb more uniformly, I tried looking for pre staining sealer but could not find one. Next step is to apply the walnut colour stain with a rag and finally for the top coat applied Asian paints touchwood finish. 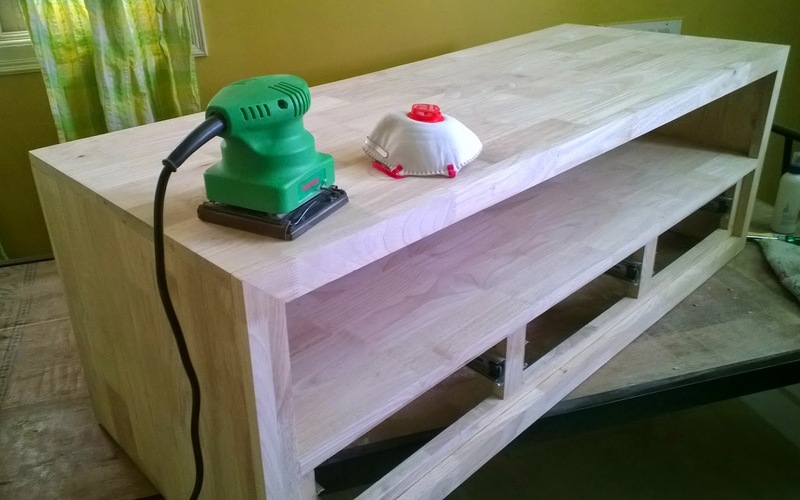 Apply 2 coats of Touchwood varnish and lightly sand between the coats with a 320 grit sand paper. In the just a collection of all the tools that I used during this project, it was a fun project to do.Loved working with Rubber wood its easy to manage and the finishing is impressive. A few queries and I'd be grateful for clarifications. - How did you manage to get the "thick" look for the top, bottom and side panels ? It looks like you've used heavy planks of timber. 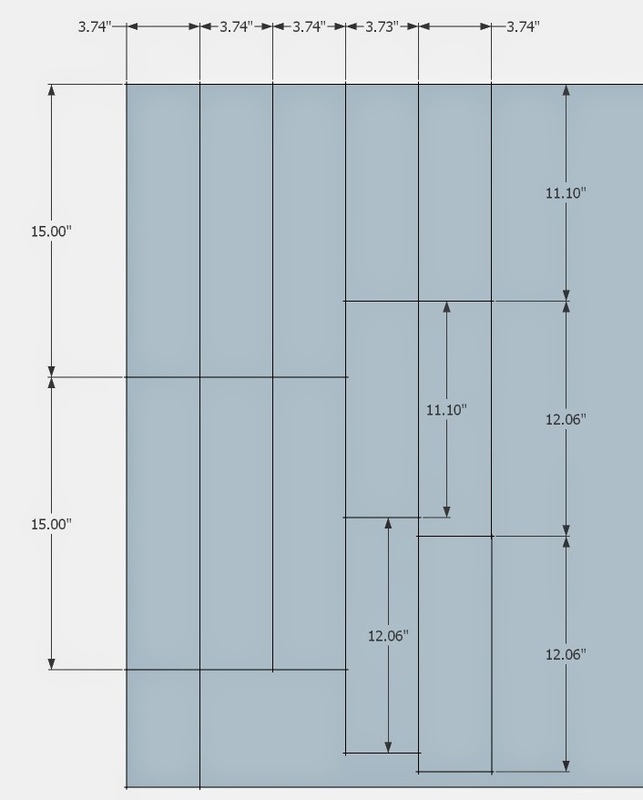 Did you join two cut sheets of 18mm one above the other ? 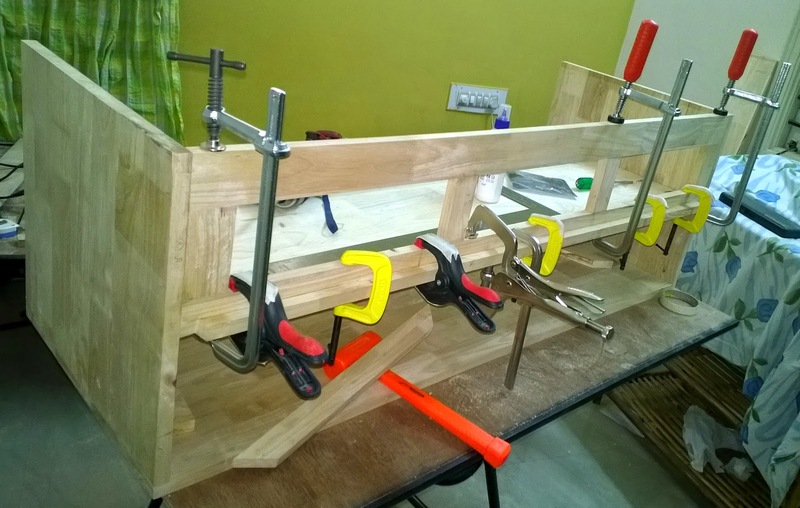 - Those are a great set of clamps seen in the picture. Where did you buy them from ? I'm from Bangalore too and some leads would be appreciated. 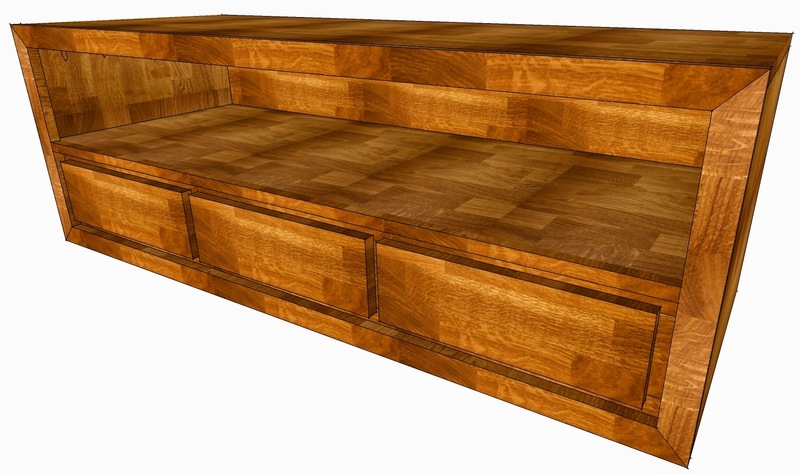 All the sides are made from single 18mm board in fact every thing except the inner drawer frame is made from 18mm board. The front frame gives that illusion of thickness. This unit is also heavy but i never faced any problem in moving it, It slides easily on the tiled flooring. One trick i often use is to place a piece of old cloth under the leg before sliding heavy objects. You can buy everything from SJP road Bangalore. My favourite shop is Goodwill you can check their website for address http://www.goodwill.in/ they sell online also but it is way cheaper if you buy from their shop.. Thanks for the reply and clarifications Apoorv. 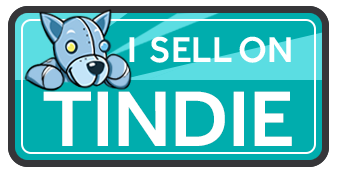 I got to know about Goodwill very recently when reading posts on diyable.net . 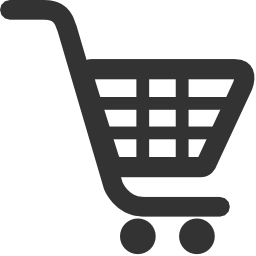 That you too recommend the store, I will surely visit it. BTW, do you log into DIYable.net regularly ? I observed that you are a member of the Forum. If I need your assistance maybe I could send you a PM there or do you have any other suggestions for contacting you ? I don't regularly visit DIYable site but a Private message would work fine as i get a mail notification for it. Thanks for that offer Apoorv. Appreciated.